Batutegi dam is now becomes one of icons that been visited by both local or foreign tourists. The dam is an interesting place to be visited because the distance is not too far from the city of Bandar Lampung. In addition to enjoying the nature, the visitors can also rent a boat that available at the pier around the Batutegi Dam. Instead of enjoying the nuance, the visitors can also tour the fishing and bring home a variety of fish that live in the dam, like Baung, cork fish or catfish. Meanwhile, if you are not lucky enough to get the fishes, the visitors can buy fishes around the dam that mostly sell by the local inhabitants. In Dam Batutegi there is Monument 13 standing. The monument was built to commemorate the 13 accidents that happened during the early construction of the dam. At that monument, there is also listed the 13 names of the victims. For those who have never been here, visiting Batutegi will be enchanted by the natural surroundings and the cooling air that can refreshing mind in the middle of busy activities. Besides being tourism site, this dam that has normal volume for 687.767 million m3, as well as spacious puddle that covering 16 km2, is also functioned as power plant; this dam is also provide the source of clean water for citizen in Bandar Lampung, Metro and Branti area in South Lampung Regency. 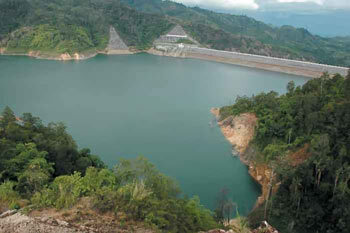 This dam is inaugurated by former President, Megawati Soekarno Putri, on March, 8, 2004.